Ever since I can remember award season has been my favorite time of year. The glitz, the gowns, the glory... It's being able to bring that intangible Hollywood into your own home (via TV of course). On occasion I get a couple friends together to watch the Oscars, but I somehow always get caught up in the kitchen cooking to really sit down and enjoy myself along with my guests. To avoid missing the coveted Best Picture or Best Actress winners, I decided to do something a little more manageable but just as tasty this year. These quesadillas are packed with so much flavor, they could win an award for best appetizer! They are super easy to throw together and although they might be a little messy, most of my guests won't be worried about ruining thousand-dollar gowns. Accept the award for yummiest and easiest appetizer! Serve alongside bacon-wrapped cream cheese dates, a recipe I made alongside my bff Ashley of Lovely Little Vices, which can turn your one appetizer into a tapas-type meal! I prefer the fig jam as a dipping sauce, but I picked up an awesome balsamic onion jam at World Market not long ago and it is pretty great with it also. Any fruit jam, preserves, or jelly which isn't too sweet would work. 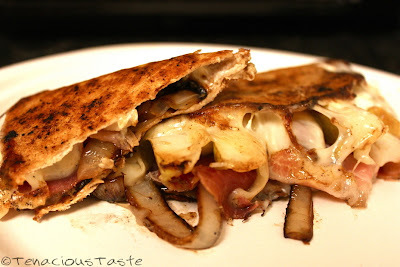 You don't want to overpower all the awesome flavors already in the quesadilla! For extra flavor, instead of using separate skillets, I sometimes will caramelize the onions in the large pan and then fry the quesadillas in that oniony-balsamic leftover oil. Haha I just posted my take on this today! I had no idea you put this up! Silly me.. I did link your blog from my post, though :) LOVE YOU! Haha I saw it! Yours looks a lot prettier than mine~ I kinda threw this one together on a whim. I think the one we made a couple months ago was little less messy too! I added onions to this one so that might be it.